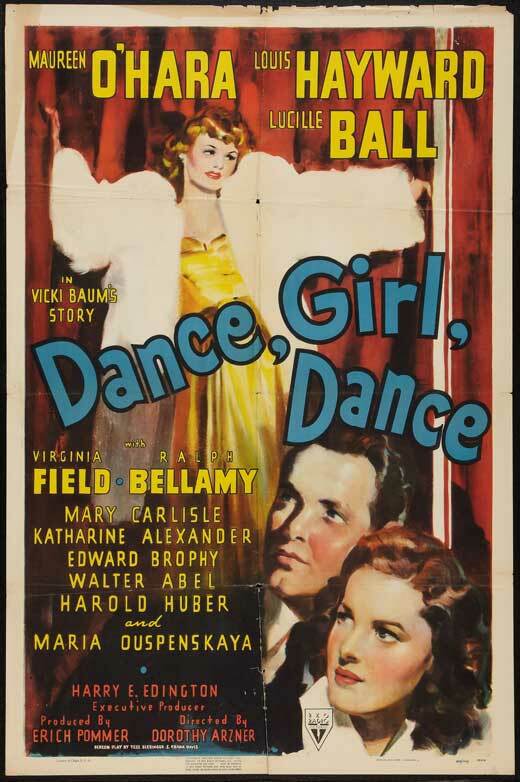 Directed by Dorothy Arzner, “Dance, Girl, Dance” is an example of a rarity in 1940’s cinema: female strong leads and, to add- A female director. I didn’t really think that this should be a big deal, but the more I read about the importance this director had on the industry and the reasoning behind why “Dance, Girl, Dance” was something a little different, it lead to a very inspiring evening. The film starts out with a bunch of girls dancing. They’re on stage, being perky little creatures. They all belong to this dance troop, with the head woman being Madame Basilova, a former ballerina who all the girls look up to. Two girls stand out directly, Judy (Maureen O’Hara) and Bubbles (Lucille Ball). Judy being more of the “good girl”, and Bubbles just being this over confident wild cat. These two are, what you may call, two totally different creatures. Madame Basilova may have her favourites with Judy, but she does admit that Bubbles naturally has that je ne sais quoi that just garners all the attention ( especially the men). Unfortunately, the dance troop that they belong to slowly melts away and the both of them are forced to find other dance positions. Bubbles immediately find a new position headlining at a burlesque show. She changes her screen name to Tiger Lily and the everyone eventually just falls in love with her all over again. She’s that blond bombshell and Judy is just looking on wishing it was her. But you know what? Judy isn’t kicked over yet. Her mentor got her a interview at this dance company, and while on the way there, her mentor (of course) gets hit by a car and passes away. But she tells Judy before leaving, that she has to make this interview! And she does. She walks up to this gigantic concrete building, up the elevator and she’s waiting for the interview to take place. But in that time, she notices a dance recital going on and it just blows her away and she realizes maybe… that maybe this isn’t the place for her. And so she disappears into the elevator. Funny thing is, the guy who was suppose to interview her, comes into the room and notices she isn’t there. He proceeds to think that this is it, my day is over and so he ends up taking the same elevator. HE TAKES THE SAME ELEVATOR AS JUDY, EXCEPT HE DOESN’T KNOW IT’S THE GIRL HE WAS SUPPOSE TO BE INTERVIEWING! HE’S COMPLETELY SMITTEN BY HER. It’s great. He follows her outside, he has an umbrella- her, nothing. She’s just little creature who is just going to get soaking wet. He sees her drop her last bit of change in the storm gutter.. no bus for her. He offers her money, he offers to share the umbrella. They’re cute, but she has that notion of pride and the interaction doesn’t last long. That’s that for now. So Judy still doesn’t have a job. Bubbles sees this as a great way of giving her old friend some work, but also getting the stooge she was looking for. The gal who will be this act in the middle between Bubble’s two sets to make the audience miss the bodacious character. It’s a hard job, but Judy thought why not. Thus in between all this, the two girls end up falling for the same guy. They didn’t know he was stinking rich, but he was. They didn’t know that he has this mysterious romantic past, and is slightly confusing emotionally, but he is. And you learn that Bubbles is the type of character to get the man drunk and marry him. Only to laugh it off and be completely happy that she now has some extra cash to roll around in. The movie ends rather in a pleasing fashion, as if every piece there was now fits comfortably together. Judy gathers herself from her situation with rich man and now has this boast of confidence to tell the audience what she’s been honestly thinking being Bubble’s stooge. Its pretty dramatic as climax speeches go. She’s standing on this preforming stage, wearing her girly dress and now with this serious, get down to business attitude. In addition to this, guess who was sitting in the audience just to see this young girl preform? GOODLOOKING GUY WHO OFFERED HER THE UMBRELLA, BUT IT TURNS OUT HE’S THE OWNER OF THE COMPANY. She’s a bit taken back, but smiles. Oh. And another thing to add, she also gets into this bitchfight with Bubbles almost off stage. She’s taken to court and then is sent to 10 days in jail. Her rich man friend bails her out. That’ the end. She has the guy who is meant for her, and she’s going to be able to dance. I really liked this morning for it’s easy to follow story, but also found it immensely enjoyable. It was back and forth and pretty realistic in some senses of how a character can behave, vs a real life you or me. Also, the more I read about the director and how much impact this film had for the industry at the time- considering the female heavy roles (the story and main characters are both ladies), it made me excited to watch it a second time. To just admire what Dorothy Arzner did and maybe how difficult it would have been. Apparently at the time, the film didn’t do as well as it initially hoped it would. Though in the 70’s, there was a spike (maybe because of women movements), and the popularity of the film has only grown. Eventually to the point, where back in 2007 Dance, Girl, Dance was selected for preservation in the United States National Film Registry by the Library of Congress as being “culturally, historically, or aesthetically significant”. I recommend this movie to anyone wishing for a good movie to watch after a stressful day. My last couple days have been a mess emotionally and my foot is killing me, but in some sense I found a way of forgetting things and enjoying what was before me. Good job Dorothy Arzner! I’m happy that you were born and able to kick off the movement of major female directors in Hollywood.